Welcome on the Site of the SBPQ! 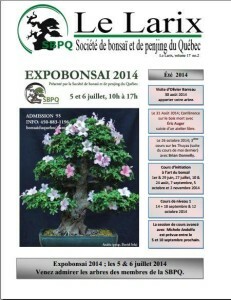 The SBPQ is a non-profit making society which has for objective to promote the arts of the bonsai and the penjing. Through the pages of this site, you will have the opportunity to discover our society, its activities and his members. The bonsai, as the penjing, are sometimes considered as difficult practices, reserved for specialists. It is true in no way. On the contrary, the SBPQ sees to it to make very accessible this oriental origin art. The society groups together amateurs of everywhere in Quebec with varied experiences and come of all the professional horizons. They have however a point in common: they share the taste for these miniature trees which we find in jars, on patches or on rocks. I invite you to investigate our site to know more about it and naturally to come to meet us at the nursery Bonsaï Gros-Bec, the head office of the SBPQ, situated at St-Alphonse-Rodriguez in Lanaudière. It is a magnificent place where you will find all that it is necessary to practise the bonsaï and the penjing. The SBPQ offers courses for the beginners as for the most advanced one! You will find all the information about the course on pages dedicated to the “training and formation”. The bonsaï as the penjing is a practice based on simple principles of horticulture bound to the culture of trees and shrubs, nothing difficult. As for the rules of shaping of trees, they are teach and learn easily! The society is there to help you in their learning and assures you a non stop help to besome a voucher bonsaïka. We offers a frame to assure the transmission and shring of experience in an atmosphere of relaxation and pleasant good-companionship. Every year we organize workshop and a big exhibition. Come to meet us there, you will be then in the heart of our society. If you have any questions, do not hesitate to write us or to phone us, we shall indulge to answer you. By hoping that you will appreciate you virtuele visit here! Un regroupement de passionnés du Bonsaï qui, par l'entremise de cette société sans but lucratif, fait la promotion de cet art millénaire en proposant à ses membres et au public, cours, expositions, conférences, etc.